ready, and look from the height of his “mirror” success is not obtained. Nikon spoke first, presenting the new Z Nikon mount lenses and two cameras on its basis: Nikon Z6 and Z7. I already told you about my first impressions of these cameras, it’s time for a more comprehensive discussion. First of all about the flagship model Z7, and Z6 but will be mentioned – the camera was also in our hands, so we offer you to get acquainted with the examples of shooting at it. The main part of the work on the Nikon Z-series – new-mount Z-mount. It is the largest mount lenses on full frame cameras today – its outer diameter is 55mm, inner – 49 mm (for comparison: inner diameter Sony E-mount is 46.1 mm, Nikon F-mount is 44 mm). Already checked – Yes, the matrix medium format theoretically be placed in his ring. Of course, for the new mount to the start of sales of the cameras trained a little directly suitable lenses: 24-70mm ƒ/4, the 35mm ƒ/1.8 or 50mm ƒ/1.8 m. In the future we plan a big expansion of the family, more about that I will discuss below. Meantime, to cope with the problem by means of an adapter FTZ on Nikon Z-series can be put under the optics F-mount lens with the preservation of stabilization and the autofocus. Nikon Z7 is positioned as an uncompromising professional camera, original, SLR analog Nikon D850 – at least the sensor used here is exactly the same resolution (45.7 megapixels) – with a high-speed burst shooting (9 frames per second) and the use of hybrid autofocus with 493 points. Direct competitor – the Sony a7R III. Nikon Z6 – his younger brother, with a 24.5-megapixel sensor, autofocus using the sensor 273, but increased up to 12 frames per second burst speed. Its direct competitor – the Sony a7 III. To start a conversation about design and ergonomics of the Nikon Z7 stands out with a loss. The fact that the move to identify in Z7 (as in Z6 — separately about identical in terms of the body camera, I will not speak) Nikon camera is quite difficult – the wave is very characteristic of the design of DSLR cameras at the time, designed by Studio Giugiaro, and touched Z-series quite a bit. Red stripe shifted to the side, the General contours resemble a variety of cameras, from full frame “buzzerblog” Sony, which Nikon Z naturally close size to the Fujifilm X-H1 when viewed from above – through the use of additional segment display of the same shape and design. Rate design in this case (unlike, for example, from a not too successful in terms of sales SLR Df) is not done – it is in Z7 is extremely utilitarian. The camera has a fairly large tab to grip the right hand with a large offset from the bayonet – fingers are placed in the space between it and the lens no problem. But the camera is low (dimensions 134 × 101 × 68 mm) – for average male hands anatomical protrusion will be a little on the small side, the little finger is on the bottom edge of the camera. However, this is perhaps the only ergonomic flaw Z7 – overall mirrorless debut in the large format Nikon have failed were almost no mistakes. Unit shutter button, zoom lever, and a pair of function keys is raised above the top panel, it perfectly fits the index finger of the right hand and well-fixed to shoot offhand with one hand comfortably. The creators behind the cameras did not spare the place for the big influx to the stop of the thumb. A mode selector is provided with a lock button, has good speed, is clearly recorded on individual values. The keys do not become less than serious Nikon SLR devices and they are made with great attention to detail: note, for example, the separator between the keys of the playback or deletion of pictures and a separate sinuses for slightly recessed keys on the zoom – to confuse them by touch buttons call menu and activate the continuous shooting is impossible. There is the joystick for quick focus-area selection, and touch screen display – can be induced by any convenient method. Available and two of the selector disk. Note unusual for Nikon the implementation of the back of them is a big disc with a large open work surface. Another characteristic (and fun) moment for potential owners of Nikon Z7 – two programmable keys-pedal near the lens mount on the other side from the key release of the lens. It is difficult at first to accustom himself to their use, but after a week the process of their involvement seems quite natural, they are exactly under the middle finger. The total number of programmable keys – 9, can also be slightly adjusted by yourself. 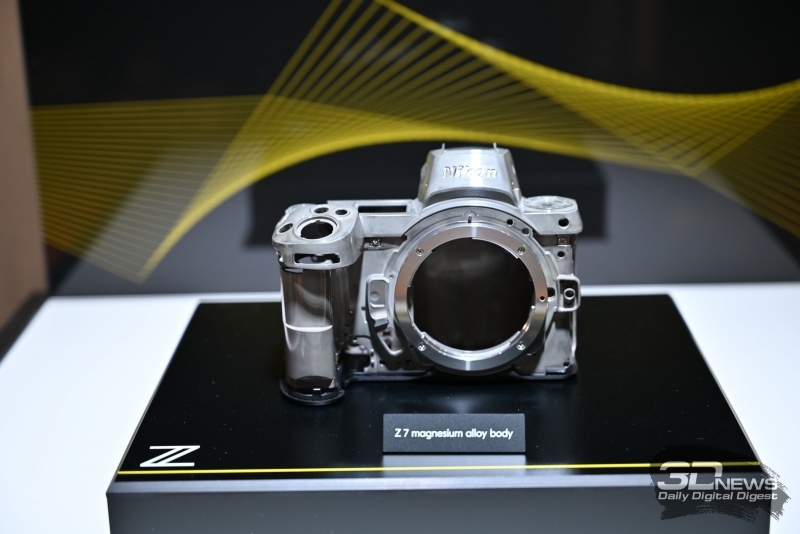 Body Nikon Z7 is made on the basis of the assembled (not-cast) chassis made of magnesium alloy, covered with plastic and equipped with traditional rubberized coating, which ensures good adhesion to the skin of the photographer. Nikon Z7 weighs 675 grams (with battery and memory card). For comparison: Nikon D850 weighs 1015 grams, and Sony a7R III – 625 grams. All connectors are arranged on the left side of the carcass and divided into two groups. In one or both of audio port, headphone output and microphone input. The second USB Type-C (and to link the camera with PC and for charging), mini HDMI (type C) port for wired remote control. On the right side is a compartment for a single memory card XQD standard. All compartments (including the battery) is equipped with rubber gaskets – manufacturer claims dust and moisture protection of the camera. Nikon and Z7, Z6 and Nikon got two of the display. The main LCD 3:2 with a resolution of 2 100 000 pixels referred to already touch coating and a hinge that allows you to turn it 45 degrees down and about 100 degrees up. It’s convenient, but why not to provide the display hinge, which can be swivelled in the horizontal plane? There is justification in view of increasing due to this thickness, the authors of the camera and applied, including in response to the question of the second slot for memory card standard SD. But how is it relevant to talk about the camera of such dimensions is up to you. The second display located on the top face. It is almost square, with an inverted (light on dark) colors, the camera can automatically adjust its brightness based on the lighting (but you can manually configure). It is strongly reminiscent of what we saw in the Fujifilm X-H1, and it’s great: the solution is much more modern and successful than the traditional grey segment displays SLR cameras. And its very presence can already be considered an advantage over full-frame “bassically” Sony, deprived of this display principle. The viewfinder is very good here: large matrix OLED (0,5’) with a resolution of 3.69 million points, with minimal lag and no stroboscopic effect when used with artificial light. It is at least comparable to what is used in Sony a7R III, and then beats him. Note of the shortcomings are just too sensitive sensor of the eye – is the tiniest speck of dust that the camera is turned off the primary display, leaving the photographer confused. The interface for the new series of Nikon cameras did not change, leaving a long and familiar main menu with vertical navigation and the ability to collect frequently used settings in the “My menu”. And logically used constantly active mode Live View, adding a separate key, i activate the quick menu. It is made in the form of a matrix, occupying about a third of the screen: the settings can be changed with one movement of the front disk. The set of parameters can also be changed at your discretion. And on the quick menu and in the main you can navigate using the touch display – it is also used for focus point selection, shutter release or manipulation of the playback pictures. Z7 is set to Nikon full frame (36 × 24 mm) sensor with a resolution of 45.7 effective megapixels. The lowpass filter is absent, is the reverse illuminated sensor. The range of sensitivity – ISO 64-25 600 expandable to 32-102 400. The direct question, “is this the sensor that is mounted on a Nikon D850” representatives of the company gave a negative answer, saying that it “was developed specifically for the Z7,” the fact that all the key specifications are the same. Probably used the same sensor as the basis, but it was modified for use in a mirrorless camera with its short operation period and characteristics in terms of heat. Processor – EXPEED only 6 latest version. The developers of Nikon Z7 is clearly the goal was to compete with Sony A7R III the continuous shooting speed. And they got it – Z7 can shoot at up to 9 frames per second with 12-bit RAW at a speed of 8 frames per second with 14-bit RAW. All this is with continuous autofocus, but fixed at the first frame exposure. Speed continuous shooting with continuous focus and single AF metering 5.5 fps. Remarkable numbers with one big “if”: Z7 Nikon, like the Nikon Z6, a small clipboard – the length of the series in RAW format (NEF) limited 17-18 frames (the same in RAW+JPEG), the JPEG format, the length of the series can reach 27-28 shots. Through the use of high-speed XQD card (in this case, with a write speed of 440 MB/s read and 400 MB/s) write the full series of memory card is done in just 6-7 seconds is, of course, comforting, but of tar in a barrel of reportage abilities Nikon Z7 poured already done. For comparison: Sony a7R III can shoot at up to 10 frames when focusing on the first frame and up to 8 fps with single-shot focus – and the length of the series is up to 30 frames in RAW+JPEG. Alas, in this respect, to catch up with a direct competitor from Nikon did not. image (8) There is a backlog in terms of autofocus. Nikon has done a great job, especially considering what usually the trouble with focusing in Live View on SLR cameras company. Here we use a hybrid system that combines contrast method with phase sensors, which are located directly on the sensor. The total number of focus points reaches 493 – they give a 90-interest coverage zone. Options are reminiscent of the autofocus system used in SLR cameras Nikon: you can select individual focus point or a zone of different size, and the “dynamic” area, consisting of nine active points (similar to the mirror models – d9). In automatic mode, focus-area selection is activated face detection – it works correctly, but if you compare with the latest generations of Sony Alpha, of course, is not enough recognition of the eye. Choose a convenient point (here and joystick, and a navigation panel and touch screen – although the latter inactive when working with the viewfinder), focus type and size of the zone by default, you can specify using the same keys near the lens mount. Unusual, but convenient. Tracking focus have and works well – but “good” still does not hold. The regularly object is lost during high-speed continuous shooting, and camera can find the process again (no guarantee, of course). Time-lapse in focus can be described already by the term “good” — mistakes happen, but first, usually microscopic (which is still annoying in portraits), and secondly, may affect the lack of alignment of optics and pre-production firmware. Basic light range of focus from -1 EV to +19 EV when you activate the AF-assist illuminator (by default enabled in auto mode) – from -4 EV. Not a record, but in General Nikon Z7 cope with focusing in the dark is fine. When focusing manually, you can enable illumination of a zone of sharpness (focus peaking), adjustable by both color and intensity – by default, by the way, it is off. With metering camera Nikon Z7 has no problems – generally the camera copes confidently and accurately under normal lighting conditions and may slightly understate the exposure in low light. Compensation available in a range of from -5 EV to +5 EV, but imposed on the body of the analog selector to adjust the no – solution for the typical SLR camera, but uncharacteristic “buzzerblog”. About the decision to make for your first full frame DSLR the only slot for a memory card and one for XQD – something hard to say. It’s a bold and radical step that may affect the decision to purchase the camera. On the one hand, it’s pretty obvious that interfeisom PCIe 3.0, which is used both XQD and CF Express (port Z7 is also suitable for cards in this format), the future. SD the speed limit if not reached, it is already very close – and all manufacturers will use the new formats combining the relative compactness and a huge amount of speed, but sharply to deny the user the ability to use any cards available… on the other hand, as a nudge to this user, if not such a drastic step? Besides the main target audience of the Nikon Z7 – owners of older Nikon DSLRs cards XQD, it may already have. No wonder the company sets their camera slots for these cards, the Nikon D4, launched in 2012. The shutter is a classic, mechanical, vertical-travel shutters – triggered in the range from 30 seconds to 1/8000. Sounds, by the way, quietly and very pleasantly. If desired, however, you can take pictures silently, enabling a fully electronic shutter, the range remains the same, not expanding. To Nikon Z7 installed 5-axis in-camera stabilizer – today it is the norm, not stabilized mirrorless camera die or move to kid segments. He does not hold the record for efficiency, but in any case compensates approximately four stages of exposure. At least complete a wide angle zoom (24-70mm ƒ/4, unstabilized) I was able to make consistent shots with a shutter speed to 1/5, and in the telephoto – with a shutter speed of 1/13. To Nikon Z7 (and Z6), there is obviously a Wi-Fi module (now release the camera without wireless modules almost indecent), and Bluetooth Low Energy, which are used with proprietary application SnapBridge. I have it since the release had a lot of complaints for a bad interface, unstable operation, cumbersome. But over time they became less and less – and, to date, remained only slightly. Hampered first connect the camera to a smartphone (it is often necessary to manually select the network from the list and camera is not recognized always), but otherwise this is a good app for the most part is stable, giving the opportunity to remote control the camera or transfer full size images and videos using Wi-Fi, and small picture (2 MB) via Bluetooth in the background. For wired data transfer is used hi-speed USB Type C (USB 3.1).